When I sat down to write this post on our recent visit to India, I had resolved to write something about the people. First I had to choose the photographs. As I began to sort and upload I wanted to put in today’s post, the number came to 21 ! and those were only the smallest number I’d hoped to share. Clearly I had to do some improvising and further sorting! So today I will focus on what kinds of work or entrepreneurship is available to Indians in India, and I can only scratch the surface as they say. I hope these pictures will show a few creative and innovative ways people, including this young boy and girl, manage to survive in a country of approximately 1.1 billion. While India’s law stipulates that within a period of 10 years of its inception in 2001, all children between the ages of 6-14 have a fundamental right to a free education. The Indian government also banned child labor, but because of economic disparity and social conditions, it’s a difficult law to enforce. There are still children in many cities, especially around temples and other tourist attractions, who continue to beg for charity. We encountered many of these ourselves either begging outright or attempting to hawk cheap items during school hours. 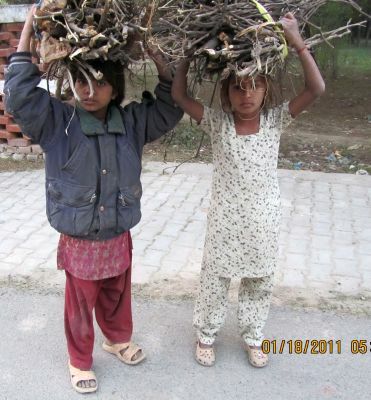 In almost every case, we told them they should be in school. One boy told us he had permission from his teacher to sell t-shirts during school hours. Interestingly enough, one district, Kottayam in the state of Kerala, has the highest literacy overall rate in India. Kerala also has the longest running freely elected communist government in the world. As for the whole of India, for adults aged 15 and above, the literacy in 2009 was 76.9% for men and 54.5% for women, compared with the world average of 84% (according to Wikipedia). 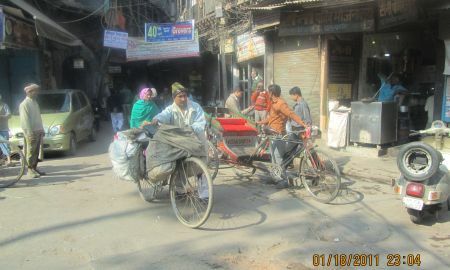 These men use their bicycles to transport goods or people (rickshaw hooked onto the bicycle). 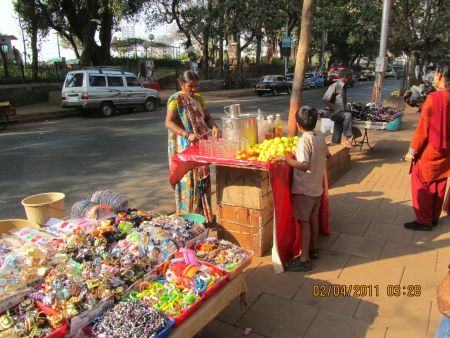 In Malabar Hills in Mumbai, very near the popular tourist destination of the Hanging Gardens (more on that in future posts), vendors set up all along the street. As you can see, everything from cheap jewelry and shoes to lemonade as prepared by this woman can be purchased. 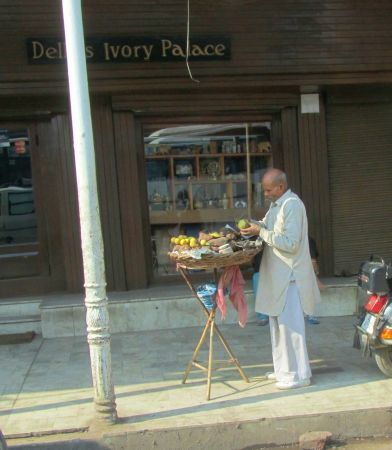 This man set up a basket filled with fruit on sidewalk outside an upscale shop in a New Delhi mall. What U.S. business would allow that unless maybe they get a cut of the profits. Tourist attractions are a great source of income for laborers. 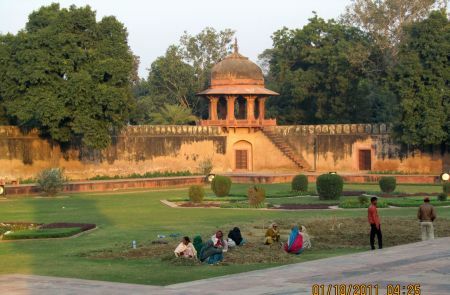 This garden is in an area of the lesser-known attraction known as The Baby Taj Mahal, which I’ll feature in a future post, no doubt. 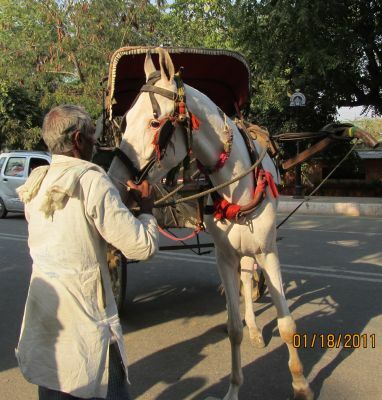 A man feeds and waters his painfully skinny horse between fares. (I always feel sorry for the animals!) And there’s always a market near the original Taj Mahal for travelers with tired feet or simply wanting a unique Indian experience such as this Tonga ride, or–as in our case–it comes with the tourist package price. 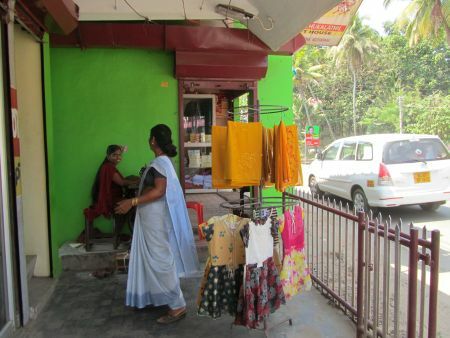 On a street in Nagpur, this woman (against the green wall) apparently needs only a small area to sew the clothing for sale on the turnstile. It’s hard not to notice a vast difference between income levels of Indians, yet the thing that impressed me most is how little evidence there is of resentment by one group for another. I feel like I was on this journey with you. India seems like such a fascinating and colourful place. A very special Happy Birthday to Hubby, from an Irish March Hare! Enjoy your day tomorrow. Thank you so much Grannymar. Every birthday has been great so far. I have prompted Alice into action on her family tree search by calling her brother in Florida to help her with it. He is a mormon and has looked into the family history and genealogy and it should be a good start. Thanks again. Have you seen Kiva.org? It seems like a good way of helping one-man businesses like this. The person has to be very clear about what they want (materials, more space, a moped), how it will improve the business and how much money is needed to achieve it. Then it goes to the Kiva website where users around the world can help with small amounts as a loan. Once the loan is achieved, the person expands the business and pays it back. If they pay it back, they can look at further loans, so there’s a real incentive to do it right. I’ve found the entire concept fascinating.